Man with black waistcoat, blue overcoat standing with left arm on hip. 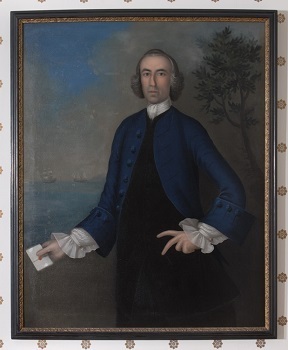 Right arm extended and holding a sealed note, ships in right background, tree in right background. Labels on back: "Timothy Orne In an Old memorandum Book 1757 is following entry 'Jos. Baggon Faice, painter, Boston my picture L6 my wife's picture L6 pictures of my four children' ". "Addison Gallery Phillips Academy Andover Massachusetts 675a.1942 Indefinite Loan Joseph Badger oil Mr. Timothy Orne." "Timothy Orne died July 14, 1767"